Eye goobers, boogers, poop, ear wax. Our bodies make a lot of sticky, smelly, disgusting substances. But all these substances actually have a purpose. Ear wax, for example, helps prevent infections and keeps your ears clean. Ear wax lubricates your ears just like tears lubricate your eyes. Without it, your ears would feel dry and itchy. 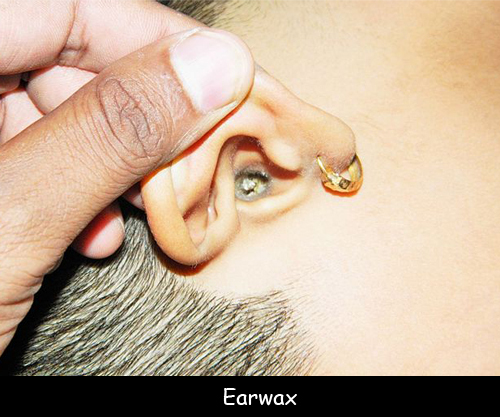 Ear wax also helps keep dust, dirt, bacteria, and pollen from entering your inner ear. We tend to produce more ear wax when we feel stressed or anxious. Some people’s ear wax is dry and crumbly. Others have moist and sticky ear wax. This probably has to do with chemical compounds in your body. Interestingly, people with moist, sticky ear wax also tend to sweat more than people with dry, crumbly ear wax. Caucasians sweat and produce more ear wax than Asians. When you move your jaw muscle, you move ear wax up and out of the ear. Don’t use a swab to get ear wax out of your ear. You’ll often do more harm than good. Some people produce too much ear wax, which can plug the ears. Running a stream of warm water into the ears during a shower will usually take care of this problem. Question: How does the ear produce wax? Answer: The skin of the ear canal has special glands that produce wax. Read more about ear wax. Declan, Tobin. " Why Do We Have Ear Wax? ." Easy Science for Kids, Apr 2019. Web. 21 Apr 2019. < https://easyscienceforkids.com/ear-wax/ >.